Nick and I are staying at his Aunt Diane’s house for the week for Thanksgiving. You know what that means? Six days of amazingly delicious food! 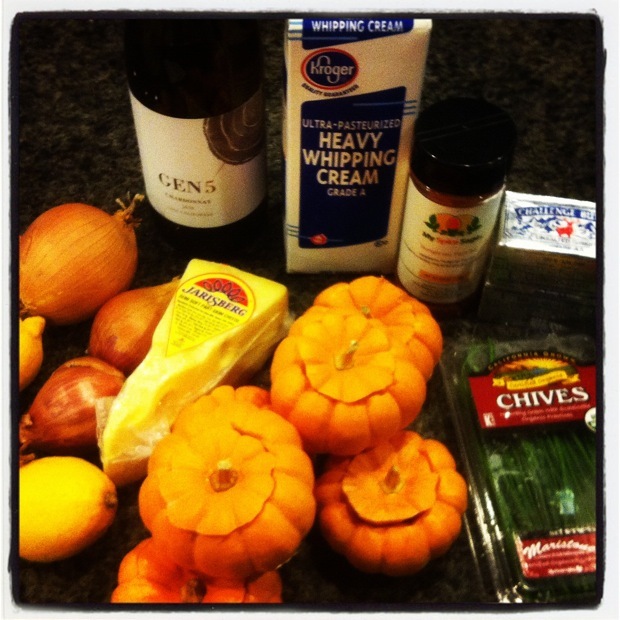 Here’s a good fall recipe that would make a great appetizer or side dish for the big day. I know, I didn’t know you could eat the little ones either. But they’re not just decorations, they’re good eatin’, too! You can even eat the skin. The good camera stayed at home for the week, but luckily I found a really fun iPhone app, Instagram, that transforms crummy iPhone pictures into fun, old-timey, somewhat acceptable blog photos. 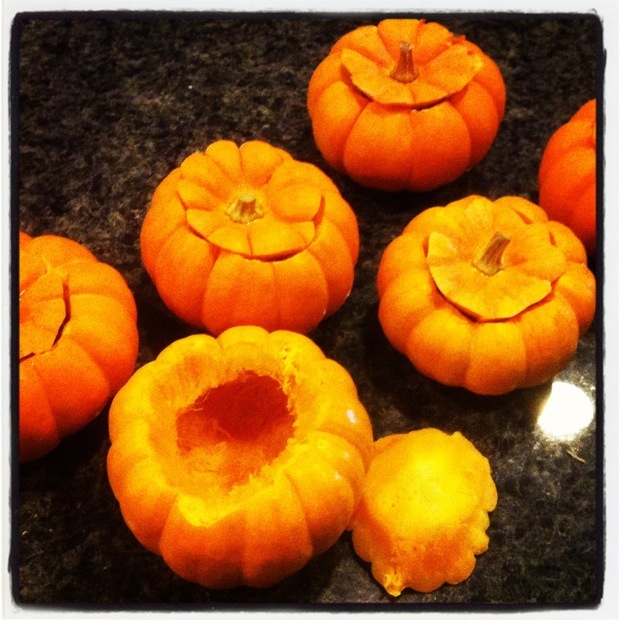 With a sharp knife, remove the tops of the pumpkins and discard the seeds. 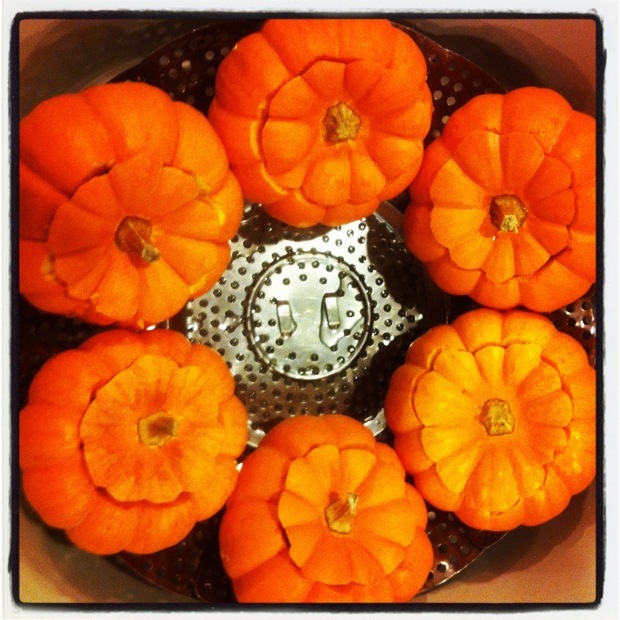 Steam the pumpkins until they are just getting soft, but still hold their shape. 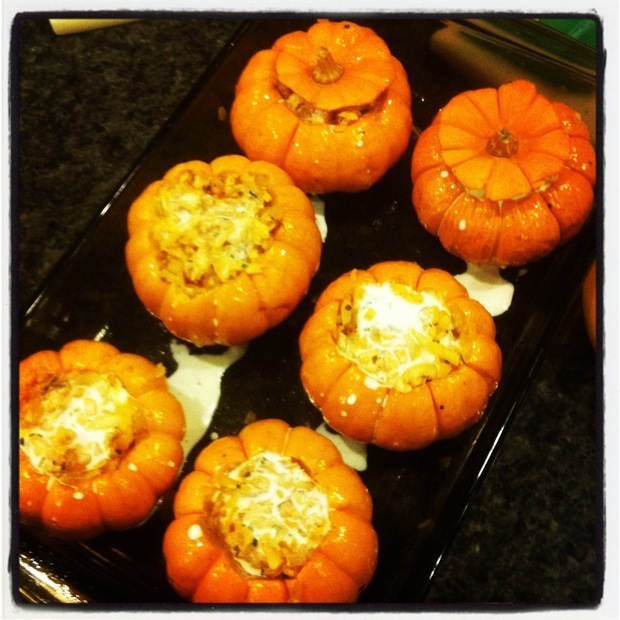 Season the inside and outside of the pumpkins with salt and pepper, and rub with olive oil. Saute the onion and butter in a small saute pan until soft. In a bowl, combine the chicken, cheese, chives and onion mix. Add paprika and cayenne, and season with salt and pepper. 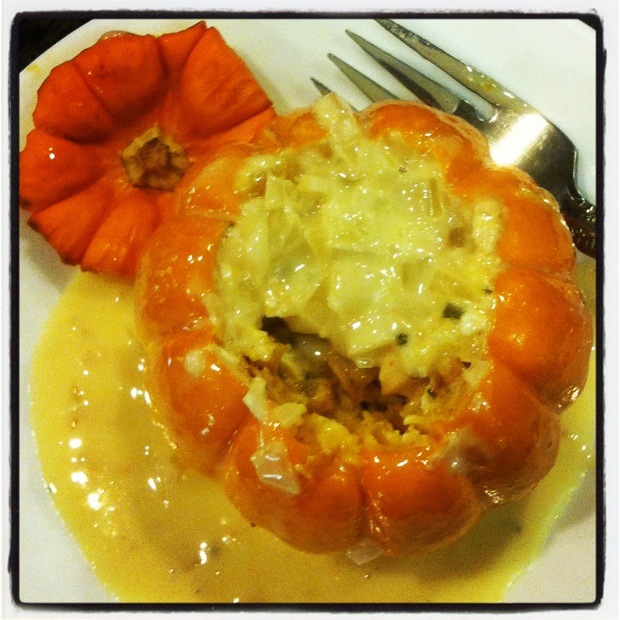 Fill the pumpkins with the chicken mixture and pour heavy cream into each pumpkin. Place the tops back on each pumpkin. Place in a shallow baking dish and cover with aluminum foil. 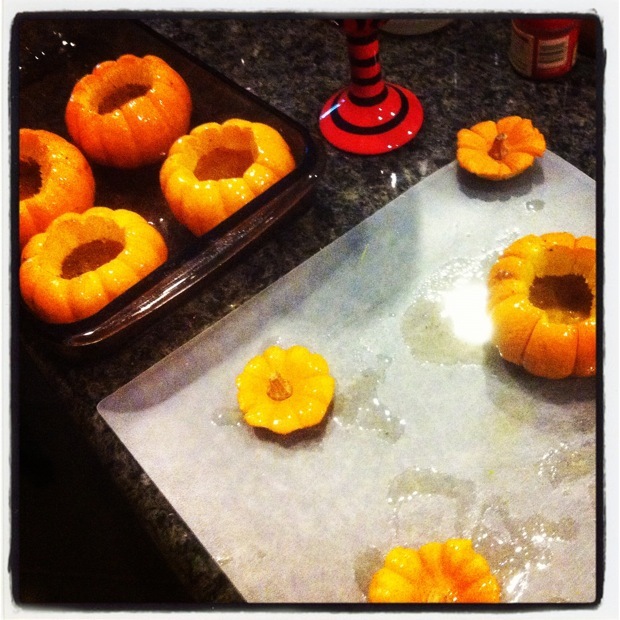 Bake at 350 degrees for about 1 hour, until pumpkins are tender. Meanwhile, to make the sauce, combine white wine and shallots in a saucepan over high heat. Boil until the sauce reduces to 1/3 the original volume. Add the cream, bring to a boil, and reduce until mixture thickens slightly. Reduce heat and slowly whisk in the butter a little at a time. (Do not boil). Add the lemon juice and season with salt and pepper. 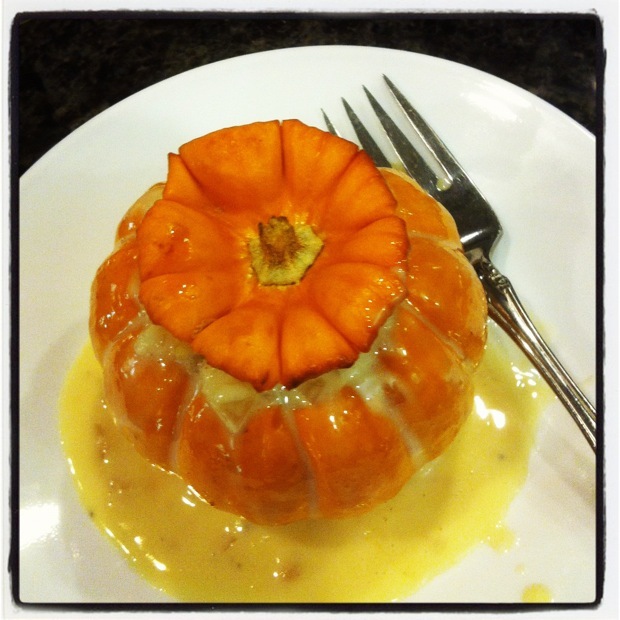 Serve the pumpkins with lemon butter sauce. these look amazing and stinkin cute! I never knew you could eat them!